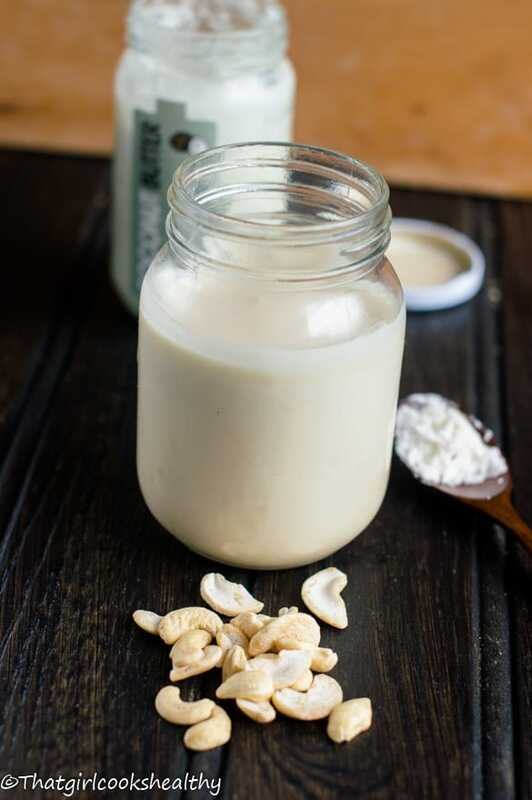 Condensed coconut milk – learn how to make this dairy free milk alternative using cashew nuts , coconut cream, sweetener and a high speed blender. 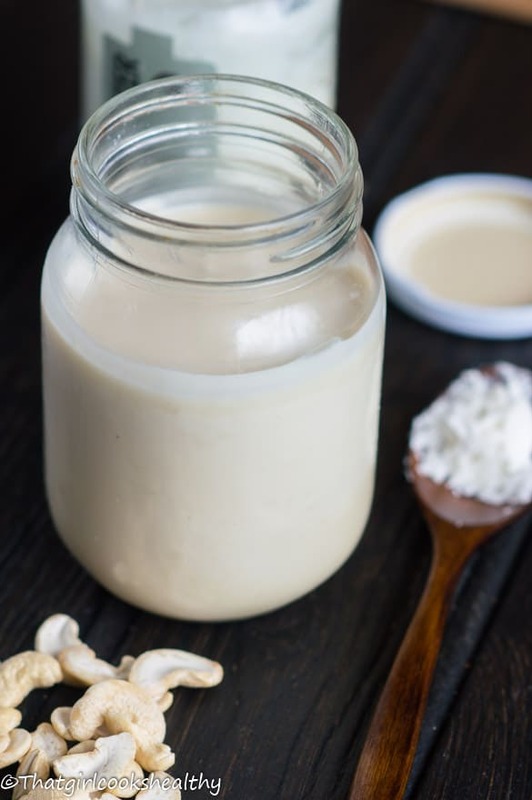 This recipe serves as a quick alternative to making vegan condensed milk using the blender method. 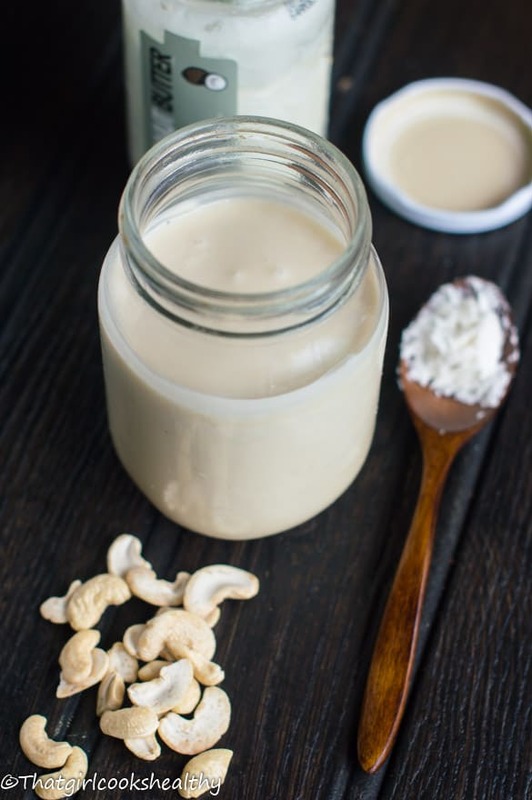 If you a looking for a way to make you coconut condensed milk in less than 10 minutes using only a small number of ingredients then this recipe is ticks all the right boxes. 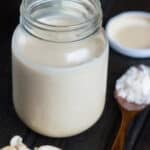 After browsing the internet endlessly to find a way to make a quick batch of sweetened condensed coconut milk I finally came across this outstanding recipe by Audrey from Unconventional Baker I literally jumped for joy when I discovered her simplistic recipe. 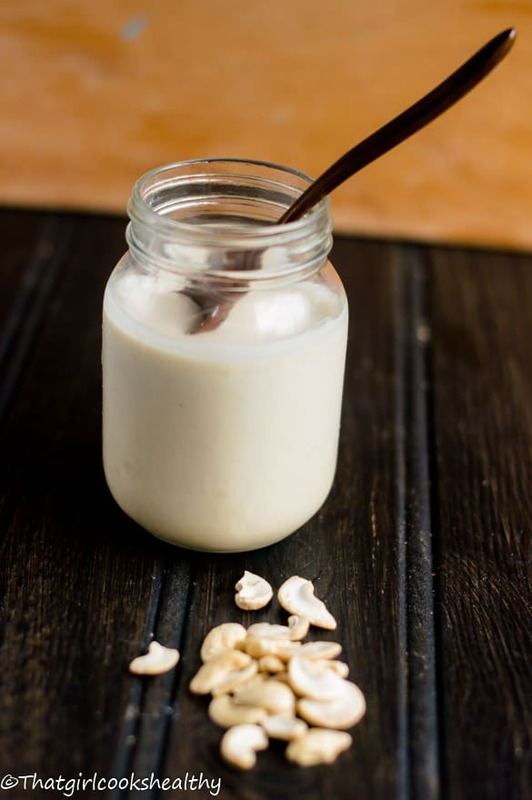 I liked the use of nuts as well as using creamed coconut instead of canned coconut milk. Full fat coconut milk especially the organic kind isn’t cheap, in fact it’s quite expensive and not forgetting the coconut sugar which is what I used in my former version. Creamed coconut and coconut butter are exactly the same thing, while I’m on the subject it’s also known as coconut manna too. When I first heard health enthusiasts going crazy about coconut butter I didn’t know what it was as there was so much conflicting information. Being of Caribbean heritage where coconut is used in various forms, I had a feeling that I’d already heard of this coconut butter thing but referred to it by different name. Coconut butter/manna is what islanders refer to as creamed coconut only it comes in the form of a solid block. One would slice into the thick block of coconut, cutting off as much as required. Ordinarily it is used in stews, curries and rice based cuisines to name a few. Unlike creamed coconut which is a solid block, coconut butter/manna is pureed almost liquid in appearance. Nevertheless both are made from dehydrated unsweetened shredded coconut. Also it’s a HELLUVA lot cheaper to purchase the block organically rather than what’s in the jar. 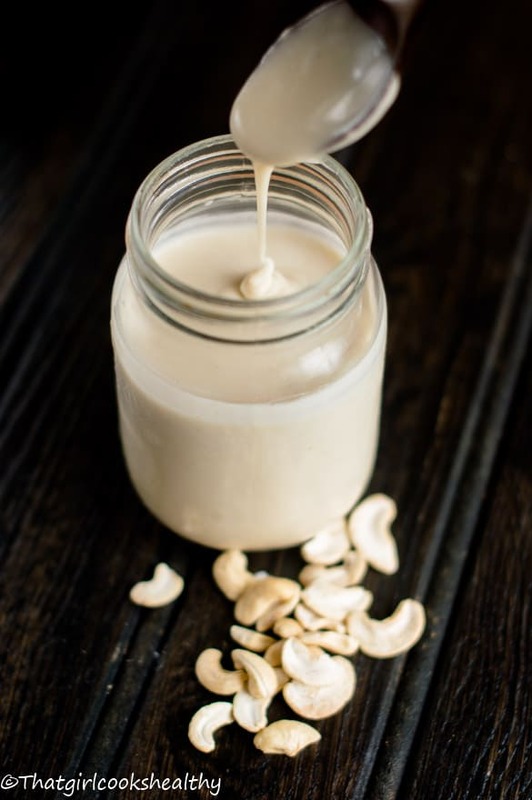 To make the recipe you can use any nut that is creamy – brazil nuts, macadamia, cashews any of those will work, just ensure they are soaked in warm water for a few hours or even overnight and a powerful blender like the Vitamix will do the rest of the work. In terms of it’s shelf life, I’ve had mine in the refrigerator for a maximum of two weeks with no problems. Now you can make this condensed coconut milk with ease, no more slaving over the stove waiting for the milk and sugar to thicken. What can I make with condensed coconut milk? Please note a liquid sweetener would be best to use as listed in the recipe card. I have listed coconut sugar only because it constitutes another low GI index alternative. For best results use maple syrup, coconut nectar or agave. Add all of the ingredients excluding the water to the blender and begin to pulse. Gradually add the water until the desired texture is achieved, it should be creamy. I found 1/4 cup of water was necessary, it may differ accordingly to your preference. Use accordingly and store the remaining milk in the refrigerator (see post for longevity). I am going to soak my nuts tonight! excited about this quicker version, Thanks a bunch and Merry Christmas! You’re so welcome, I hope you like it! This sounds yummy. Will honey work well as substitute for sugars? Yes Karin, honey will work just fine. Hi! Can I substitute the manna? Would coconut oil work? Hi Gina, unfortunately not. The manna is the main ingredient and there is no substitute, coconut oil would not work on this occasion. This is brilliant!! I have been searching for condensed milk (non-dariy) and all I find are cans on Amazon. You have officially changed the game with this recipe! OMG!!!!! This recipe is amazing. Granted I thought I’d messed things up when blending because it wouldn’t come together, but I realized I used more nuts than recommended since I was trying to use the of what was in the bag. Once I added more water, things took off from there and the lemon juice is critical as it mimics the canned stuff perfectly!